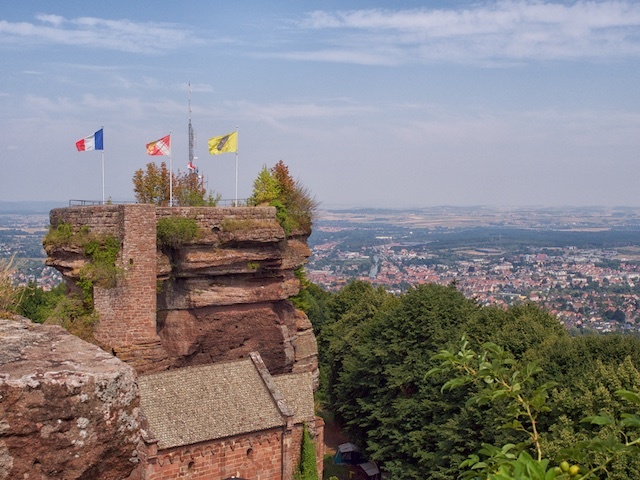 In the fifteenth or was it the sixteenth century, there were a series of signal towers built every few kilometres apart, which were used to send communications between Alsace and Paris. It was a marvel of technology really, with giant signal flags used to send coded semaphore messages. Here we are, five hundred years later and astonishingly the very same towers are still in use for that very same purpose albeit that the communication flowing through them is more likely to comprise photos of kittens than news of invaders from the east. I can only imagine the planner’s arguments for erecting mobile phone towers on World Heritage Monuments;- “Existing conforming use” perhaps? Yes it was still stinking hot, perhaps the last hot day of summer and yes we were probably as mad as the young lady in the air-conditioned supermarket we visited on the way home had said we were, but we convinced George and Karen to walk with us to the peak of the Chateau du Haut-Barr, perhaps our favourite ruin where we made use of the very same communications tower to phone Jacques and Cathy who joined us for a very light lunch and an enormous amount of rehydration while marvelling at the view over all of Alsace.